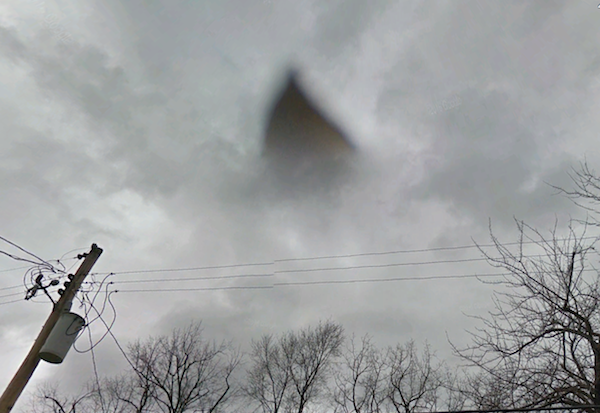 UFO SIGHTINGS DAILY: Dark Triangle UFO Over Neighbourhood In Louisville, Kentucky Following Google Map Car, UFO Sighting News. 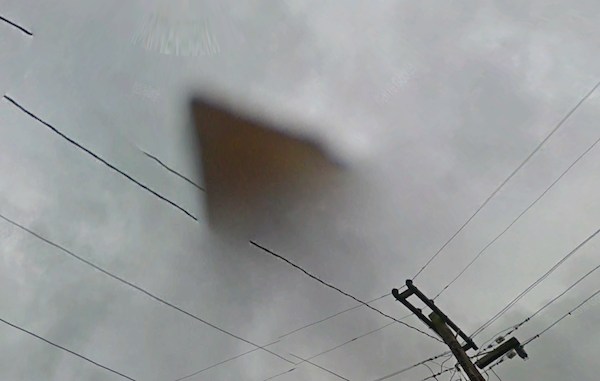 Dark Triangle UFO Over Neighbourhood In Louisville, Kentucky Following Google Map Car, UFO Sighting News. This is a cool report, but was lacking the Google coordinates to confirm it. 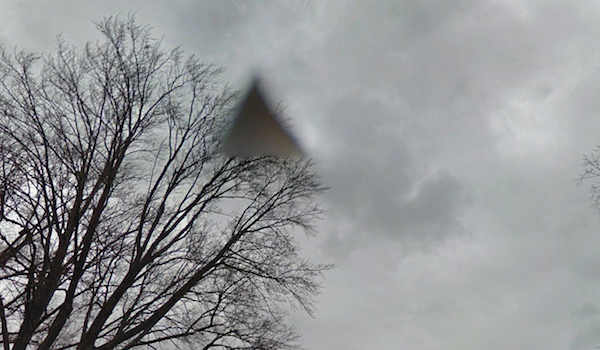 I luckily found the coordinates and yes, the triangle UFO is there. At the coordinates of 38° 6'23.28"N 85°51'20.04"W if you go into street view by dragging and dropping the orange person icon in this location, you will notice a dark UFO hanging over a white house. I look around the neighborhood on street view and found that the dark triangle was following the Google car for a little ways. The triangle was sometimes in front of the trees, meaning its size was only about 1 meter from corner to corner. 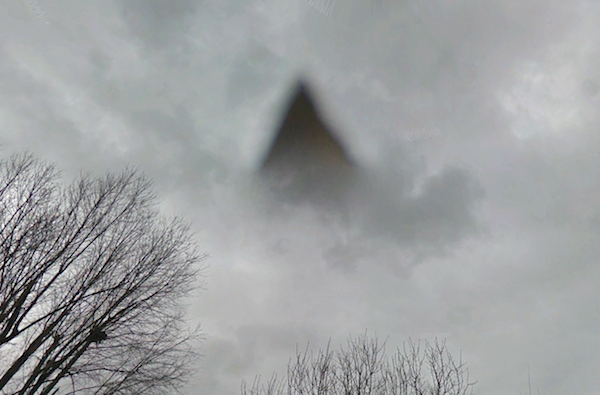 It was probably cloaked, but the Google cameras digital eye caught it. 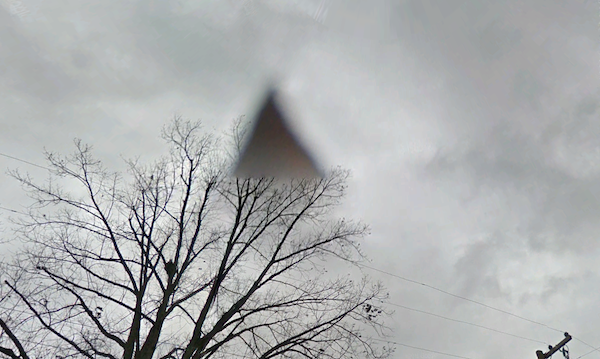 Google has a program that blurs faces, license plates and apparently UFOs now. If you notice the blur over the window and the blur over the UFO appear to be made by the same cover up tool. My son was looking for his phone and realize it was on his bed, when he picked it up google satellite was some how pulled up on his phone, he was like what the heck .. so he started looking at what the satellite map was on.. he realized it was on our house, he was shocked to see a object hovering over our house.. the object appears to be triangle in shape and brown in color... he snapped shot from different angles ... I am not sure what this object is, it could be a leaf or something on the satellite lens... but looks to be a UFO.., would love for your team to look at pictures and let us know if this is a object on the lens or if a UFO was really over our house! Below, notice the UFO is in front of the trees and is a perfect triangle.